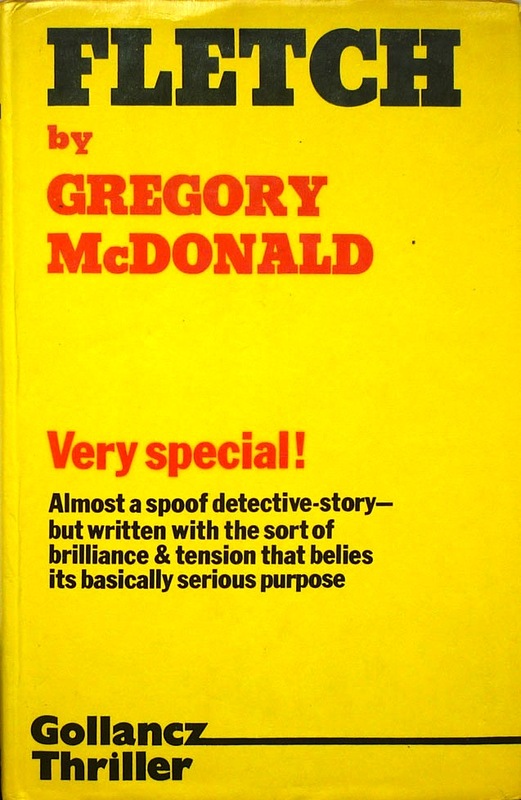 First published in hardback in the UK by Gollancz in 1976 – two years after the US Bobbs-Merrill edition – Fletch was American journalist-turned-author Gregory Mcdonald's second novel, following 1964's Running Scared. 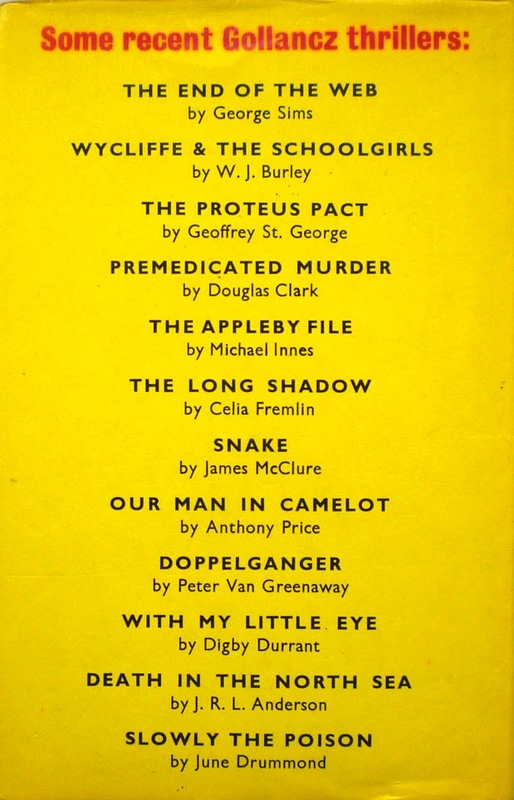 It was also the first in what would become an eleven-book mystery series, one which would hop back and forth across the life of both its title character, investigative reporter I. M. Fletcher, and latterly his son, and would also spin off another four-book series featuring police inspector Flynn. 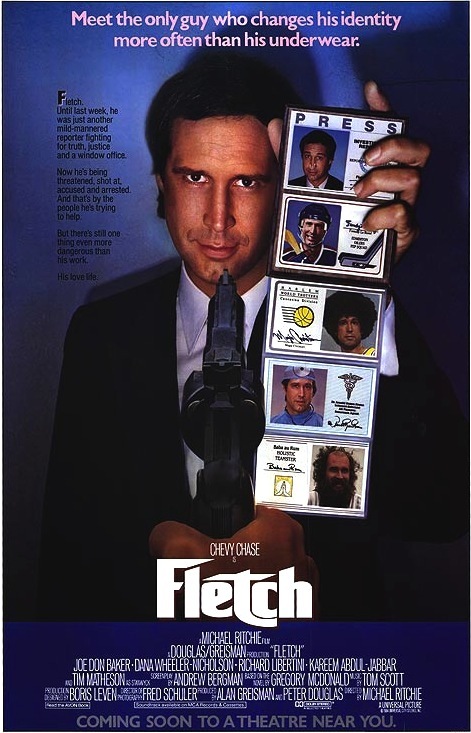 But more pertinently from the perspective of this 'ere series of posts, in 1985 Fletch was turned into a film, starring Chevy Chase as the eponymous lead. Now, let me just state for the record here that I'm a huge fan of Michael Ritchie's movie (which was scripted by Andrew Bergman, who also wrote Blazing Saddles). I rarely miss an opportunity to respond to a "thank you" or, even better, a "muchas gracias" with "Tierra del Fuego", or reply to enquiries as to what I do for a living with "I'm a shepherd". But as eminently quotable and gloriously silly as Fletch the movie is – and even though it was my gateway to Mcdonald's series (which, courtesy of Beckenham Library, I made my way through during the 1980s, although I don't believe I ever read the "son of Fletch" books) – the original novel still, I think, stands as the superior work. A big part of the reason for that is Mcdonald's narrative approach. Fletch – all the Fletch novels, in fact – is very dialogue-heavy, with little in the way of description. Chapters typically begin with a conversation and progress from there, Mcdonald filling in the gaps where necessary. But where, say, George V. Higgins's similarly dialogue-heavy prose, with its long speeches posing as conversations, can become wearying (or at least, can for me), Mcdonald keeps it light and snappy, the back-and-forth banter between Fletch and the various players a joy to read. Alone in the chief's bare, utilitarian office, they sat on either side of a gray aluminum desk. "By any chance, could Fletch be short for Fletcher?" "Is Fletcher your first name or your last?" "Fletcher Smith," the Chief said. "Seems I've heard that name somewhere before." "No. Just Smith. Where do you live, Smith?" "I forget the address. Where your goons picked me up this morning." "Weekends I spend in Hawaii." "Except for a pet roach." "And what do you do for a living, Mr. Smith?" 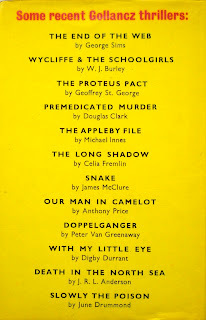 The Gollancz edition of Fletch has become fairly uncommon in first: AbeBooks has just two copies listed at present, one of them ex-library (ignore the listings for Confess, Fletch, the first sequel, which has been mistakenly listed as being published in 1976 by a few sellers; it was actually published by Gollancz in 1977) – rather less than the Bobbs-Merrill first, of which there are over twenty copies currently available. I read this book in the late 1980s - really enjoyed it and could see why it translated well into a movie. The humor and crime/mystery combination was great summer reading. Great summer reading indeed, Amy. Have you read any of the sequels? I don't recall them being quite as great as Fletch, but certainly the early ones are worth a look. 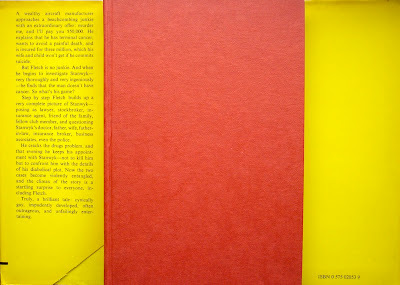 I confess, I don't often see mini-reviews from the publisher on a book cover. Blurbs, yes. Mini-reviews, no. Haha, you evidently haven't seen many Gollancz jackets, Chris. Common practice with that publisher's yellow (and red) wrappers: click on the Gollancz tag at the bottom of the post for further examples; the blurb on Day of Misjudgement in particular has to be seen to be believed. You couldn't be a suburban American teenager in the mid-80s without seeing this film endless times on HBO or Cinemax. As you mention, Nick, it's emminently quotable and definitely the best thing Chase has ever done, IMHO. The sequel was funny, too, but just not as much as the original. 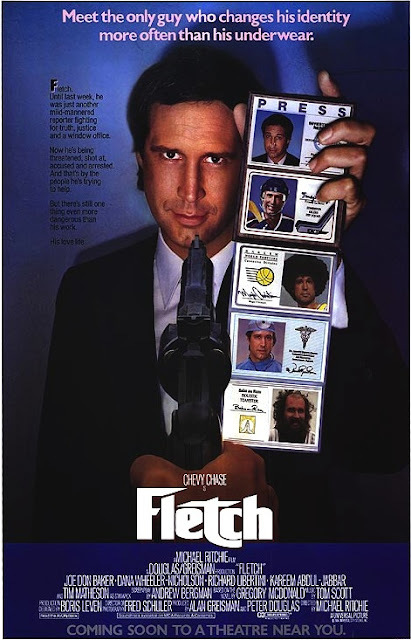 The sequel, Fletch Lives, wasn't based on a Gregory McDonald book, but the storyline, where Fletch inherits a Louisiana Plantation from his Aunt, begat some humorous one-liners and sight gags. Indeed, Dave, although I've only discovered John D. and Ross latterly. You may be right on Gregory Mcdonald's only strength being dialogue – I must admit the plots of the subsequent Fletch (and Flynn) novels have vanished from my memory. But that dialogue alone is reason enough to read him, I reckon.